There are a number of things to note when purchasing or using a charger, namely the 'Type of Charger', 'AC Input' and 'DC Output'. Most electric scooters and bicycles use lithium-ion or lithium-polymer cells, so we will stick to those for this page. NOTE: Chargers in Singapore must be certified by SPRING. Type of charger: This refers to your battery chemistry. Charging methods are the same for both chemistries which means that the respective chargers are interchangeable. 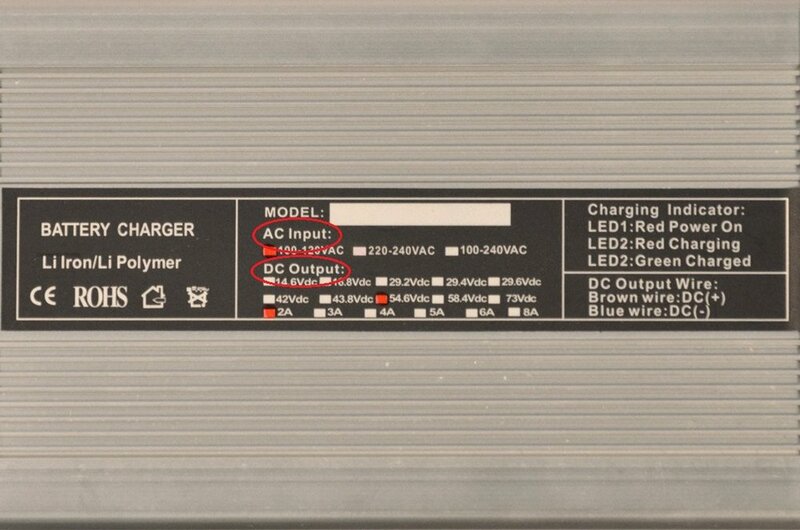 AC Input: This refers to the voltage coming out from the power socket you intend to plug the charger in to. The charge current (A) will determine how fast your battery will reach its full charge voltage. 2A-5A chargers are common. Generally, batteries are able to accept much higher charge currents but conservative limits are commonly used by manufacturers to prolong battery life. You may use our Battery Calculator to find out how your batteries charging time will be affected. The basic algorithm is to charge at constant current (0.2 C to 0.7 C depending on manufacturer) until the battery reaches 4.2 Vpc (volts per cell), and hold the voltage at 4.2 volts until the charge current has dropped to 10% of the initial charge rate. The termination condition is the drop in charge current to 10%. The top charging voltage and the termination current varies slightly with the manufacturer. The charge cannot be terminated on a voltage. The capacity reached at 4.2 Volts per cell is only 40 to 70% of full capacity unless charged very slowly. For this reason you need to continue to charge until the current drops, and to terminate on the low current. It is important to note that trickle charging is not acceptable for lithium batteries. The Li-ion chemistry cannot accept an overcharge without causing damage to the cell, possibly plating out lithium metal and becoming hazardous. Float charging, however, is a useful option. The safety issue with keeping the battery on constant charge is that if the charger should somehow go haywire and apply a higher voltage there could be problems. And, so the logic goes, the shorter the charger is turned on the less likely the charge will go haywire while connected to the battery. However, there is another safety method, the battery protection board or BMS (Battery Management System), which should be included either on the battery or in other circuitry between the battery and the charger. A C-rate is a measure of the rate at which a battery is discharged relative to its maximum capacity. A 1C rate means that the discharge current will discharge the entire battery in 1 hour. For a battery with a capacity of 100 Amp-hrs, this equates to a discharge current of 100 Amps. Trickle charging means charging a fully charged battery under no-load at a rate equal to its self-discharge rate, thus enabling the battery to remain at its fully charged level. A float charger (also called a storage charger, maintenance charger, or smart charger) will charge a battery at a similar rate as a battery self-discharges, thus maintaining a full capacity battery. However, the main difference between a trickle charger and a float charger is that a float charger has circuitry to prevent battery overcharging.